We've just returned from 8 weeks in Australia, bronzed and with 4 kilos extra around the midriff. Thanks to the generosity and hospitality of friends and family we couched surfed our way up and down the Great Dividing Range from Toowoomba in south-east Queensland to Geelong in southern Victoria. This blog post is dedicated to thanking all those people who made our wonderful holiday possible, and contributed to our enjoyment of the time. At every place we stayed we laughed, we ate, we talked. We felt how lucky we were, and hope that our friends and family know how much we appreciated the time spent with us. My sister Kathy, me, Dad, Mum. The Dads: We stayed several times for a few days with Simon's Dad Ernie at Woy Woy on the New South Wales coast north of Sydney, where he lives in an independent living retirement complex and visiting Simon's Mum, who is now in a nearby Aged Care Facility. Ernie was very generous with money in the bank for Christmas and birthdays to help fund our trip. My Dad lives in Pittsworth in the house where I spent my teenage years, near Toowoomba in south-east Queensland. 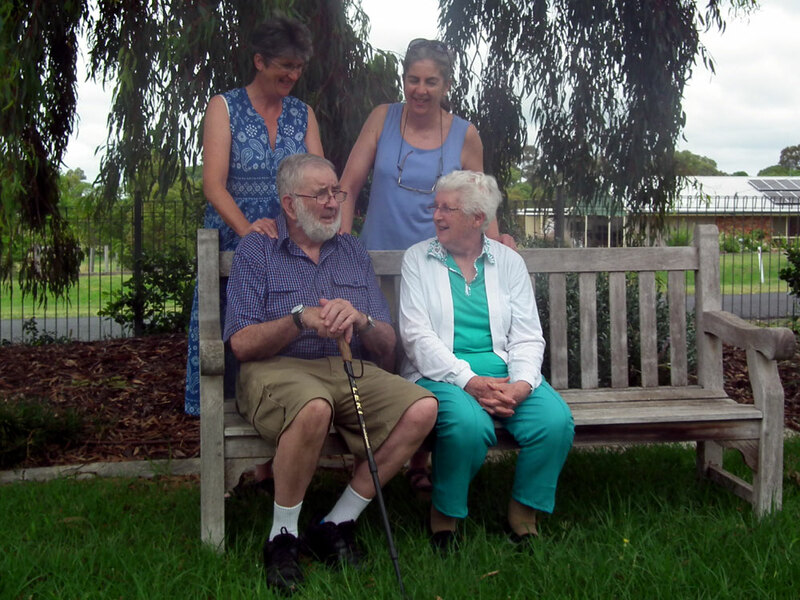 We spent Christmas, my birthday and my mother's birthday here, spending the time with my sister, her husband, his mother and my mother, who lives in an Aged Care Facility just a few streets away, but is physically quite spry and she spent most of the day with us. My sister and I spent much of the time cooking, both for the groaning festive table, and to put in the freezer as ready meals for Dad to eat later. 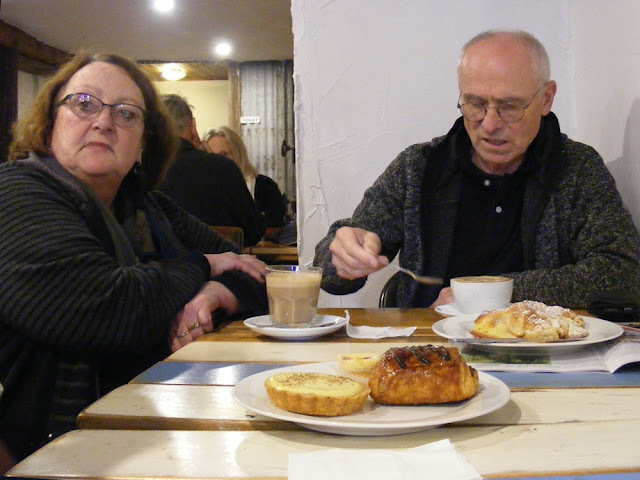 Sue and Leon at a bakery-café in Kyneton. 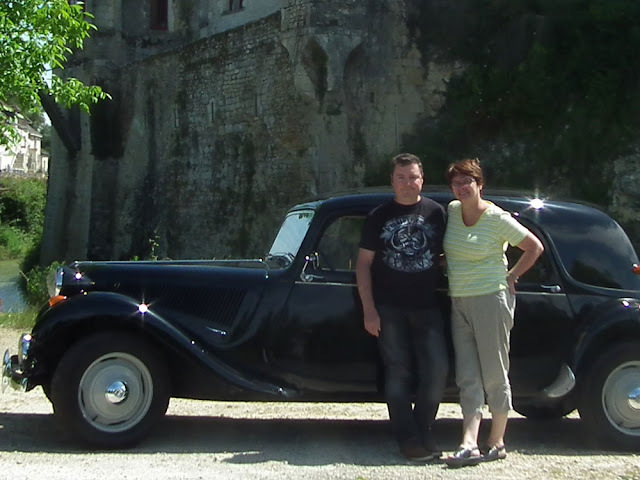 Leon and Sue: We first meet Leon and Sue in France, when they visit every couple of years. 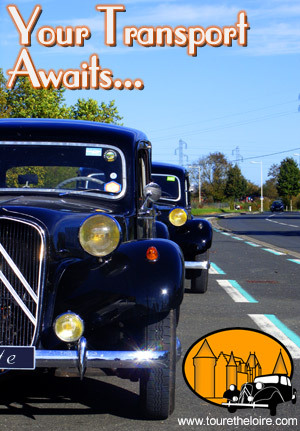 They are fellow bloggers and have recently moved to a lovely new home in Trentham, central Victoria. With them we experienced Trentham and districts thriving foodie culture. Sue is a very keen cook but broke two vertebrae in her spine during her last visit to France. Consequently she has been finding cooking difficult. 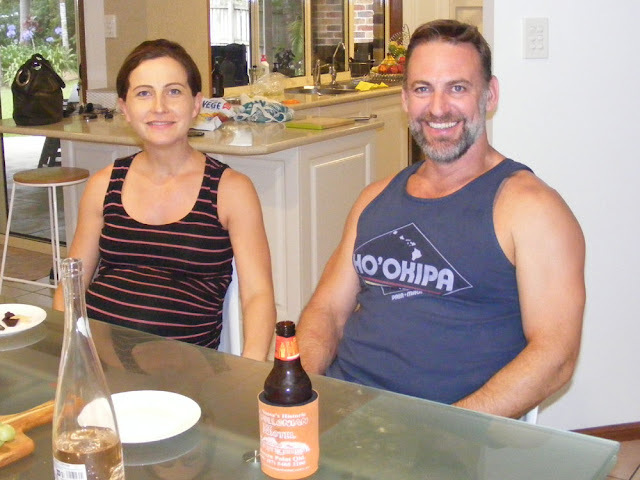 Nevertheless she directed Leon to produce a superb smokey barbecued boned and marinated leg of lamb. Ric and Sheila, in the woolshed (or is it a cinema?). Ric and Sheila: Ric is my father's younger brother and he's married to Sheila. 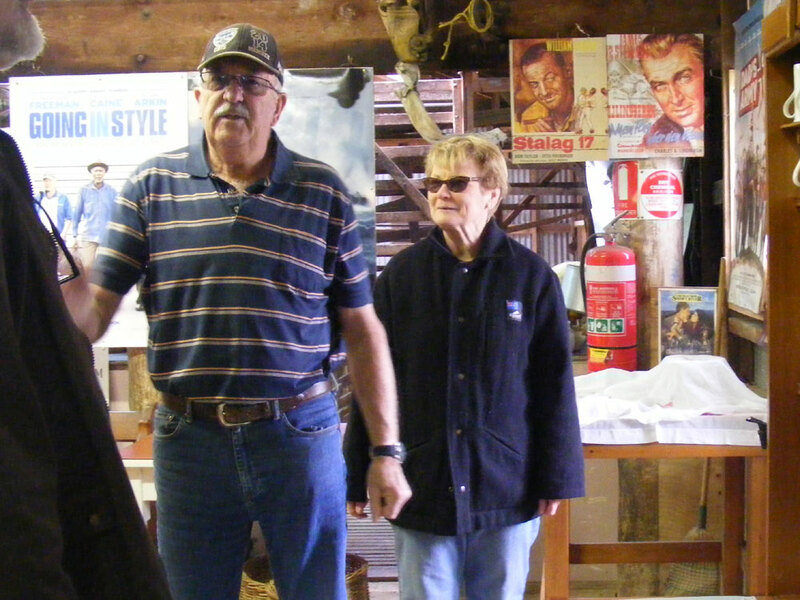 They live on a small but busy sheep farm overlooking Bass Strait, near Geelong in Victoria. Ric is a cinema buff and runs a private cinema in the woolshed. When shearing time comes around, movie posters are taken down and shearing rigs put up. Sheila cooked one of their lambs, invited my cousin Josh to dinner and we talked about sheep. Ric regaled me with tall tales and true of his childhood, my father and grandfather. Simon with Rick and Helen at Candelo. Rick and Helen: We've stayed with Rick and Helen before on a previous trip. They live at Pambula on the New South Wales coast and since we've last seen them have had some nasty health scares. 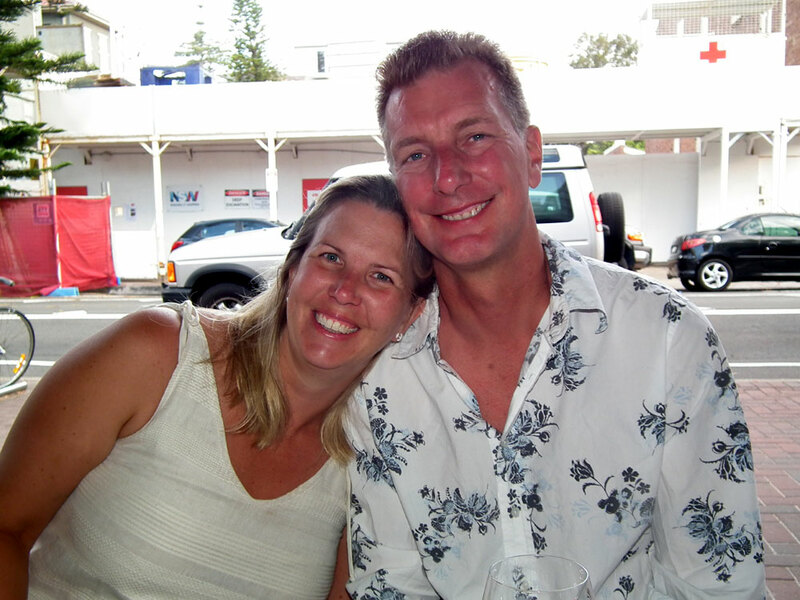 Rick was diagnosed with a serious heart condition, which luckily has been successfully treated. Helen has developed the very rare Mammalian Meat Allergy, which is ongoing and impacting severely on her diet. Boy is she sick of chicken! They introduced us to the reinvented Tathra pub, which has been sensitively restored and does great food, and the general store in Candelo, which does a great veggie burger. so here's one of them from their visit to us last year. Bruce and Annette: Bruce is one of Simon's school friends, and he and Annette live in Canberra. He's a chef and they were busy preparing for the Christmas meal they and a team of volunteers produce every year for homeless, lonely and disadvantaged people. I hope Annette remembered not to put red onion in the bean salad! (There was considerable hilarious discussion about the niceties of where red onion was appropriate and where it was not. As a chef with bi-polar, Bruce has very definite opinions about this.) Annette's parents were Italian and so she made us gnocchi (nearly as good as Nonna's!) and we enjoyed family made salamis. Matt, Nina and Samara: Matt was the guitarist in the band that Simon played in when we lived near Toowoomba. Nina is his lovely wife, who was heavily pregnant when we visited. She looked like a super model smuggling a basket ball, and a couple of days before we left Australia she gave birth to Sienna, who looks adorable in the photos. Samara is Nina's mum and lives in their granny flat. Nina's family come from Croatia, but they are Serbian and Bosnian. When the war broke out Nina was 12, and her father very sensibly decided to bring the family to Australia, where they have made a good life for themselves. Samara orchestrated a feast, with barbecued meat, potatoes dauphinoise style and salads. Geoff and Christine: We first met Geoff and Christine in France too. They came here on holiday, and to do a bit of house hunting. They live in the New South Wales Northern Rivers town of Lismore, surrounded by rainforest. Christine is an artist specialising in landscapes of the coastal heathlands. 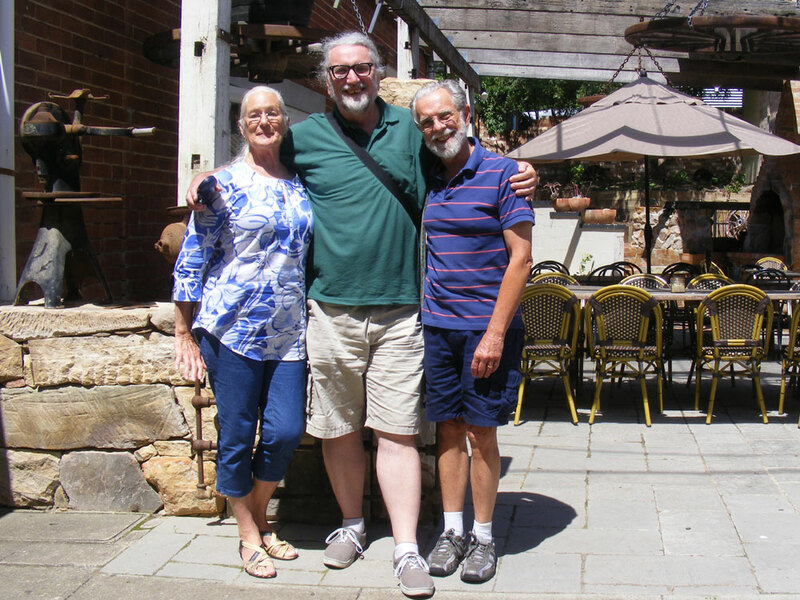 They invited us to stay after a series of the most remarkable coincidences, involving them meeting our friend Melvyn, who lives near us in France, in a café in Goulbourn in New South Wales. At the time, they didn't even realise we were in Australia too. Jon and Rosie: Jon is Simon's brother and Rosie his wife. They live in Canberra, where their large house is open to people coming and going all the time. They are the most remarkably easy going and hospitable people. They were also generous with money in the bank for Christmas, and most importantly of all, the loan of a high powered sports car in which we did about 7000 happy kilometres. We also got to use their appartment in Manly, the beachside suburb of Sydney, enjoy sailing on their boat and use their snorkelling gear. Of all the people we owe a big thanks, Jon and Rosie deserve the biggest. Elizabeth and Vic: Elizabeth is Simon's sister and Vic is her husband. They live at Ettalong Beach, north of Sydney, and enjoy the beach lifestyle to the full. They have a granny flat which made staying with them easy and comfortable. We enjoyed walks on the beach, sailing and Elizabeth's home made sourdough, salads and kraut. Vic is in the throes of writing a book and Elizabeth dashes about like a mad thing in a female friendship group who make art and swim. Other people featured prominently in our days in Australia too. Liselle, who fed us crepes for breakfast and pasta for dinner; Erica, who walked us up hill and down dale; Helen, Denise, Kathy G, and Merryl, who I went to school with; Trish and Bruce, who have 'retired' since last time I saw them, the Mums, who we visited at their nursing homes and took out for day trips; Kathy and John, my sister and her husband who we walked and talked with; Hugo and Penny, who Simon went to school with and who fed us delicious salads; Sue and Don, Simon's first wife and her husband; Kat and Felicity, Simon's daughter and granddaughter; Jack, Tom and Jess, Simon's nephews and niece; Josh, Claire and Georgia, my cousin, his wife and their daughter; Poss and Brian, my father's sister and her husband; Sally, Emily and Ella, my cousin and her daughters; Mark, another of my cousins; Trev and Noel, Simon's school friends. Then there is our housesitter, the diminutive Dotty. She was an absolute trooper and despite her struggles with our wood stove we came home to a house that was cleaner and neater than when we left. She has moved a couple of doors up the street and is now dogsitting for one of our neighbours. We came home to the stove lit and warming the house and box of organic vegetables on the kitchen bench. Finally, last but not least, I would like to thank Simon for his meticulous planning of our trip. I contributed virtually nothing, being too busy and stressed with Brexit issues. Happily I more or less ignored these whilst away, apart from a brief spell in early December to make sure my local contacts were aware of important discussions in the European Parliament about citizens rights. Simon's planning included not just our itinerary, but our budget, and we are proud to see that our holiday budget account has $20 left in it. Simon also did all of the driving, which although we had a wonderful car, it did have racing seats that were not really designed for someone of his size, and driving it through the mountains, on the highways and through downpours for 7000km over 8 weeks was not nothing. For me it was a wonderful exercise in friendship and networking. At first I was uncomfortable about how generous people were to us and felt I was putting people out by lobbing up on their doorstep. But by the end I realised that all these warm and caring people enjoyed having us come to stay as much as we enjoyed their visits to us in France. Making up the spare bed and getting a load of delicious food in because people are coming to stay is a joy and to be treasured. (Now I just have to convince myself that cleaning the bathroom is also a joy if it means it will be nice for guests...). A marathon of a trip and Vote of Thanks that must have been well deserved and received. Thanks for sharing it with us - your blog readers. This is a lovely tribute to all of the people you visited for their generosity and friendship. I'm sure they appreciate both your public and private thanks. Good family and friends are one of the joys to be treasured. Tim and I are really pleased that you had a wonderful trip and hope that you are refreshed and ready for the year ahead. Your parents, Susan, look exactly the way I remember them a few years back. It is always a joy to spend quality time with family and friends and I'm glad you and Simon were able to do that as well as enjoying the weather and the running around. It looks like you had a great summer (in winter!). Good to hear you both had a lovely trip, sorry we couldn't catch up this time, looks like I was up at Townsville while you were in Toowoomba.